I live in an area that has experienced hurricanes, but not since 2011. Some around here now feel that we’re free of that threat. There might be some truth, at least for a while, given that current weather trends tend to have wind shear that trim the tops of hurricanes, weakening them, and there is a natural pattern that tends to push the storms back out into the Atlantic. We’re good, right? After all, once a weather pattern occurs, it doesn’t change—does it? Long ago, in statistics class I was taught an interesting fact. 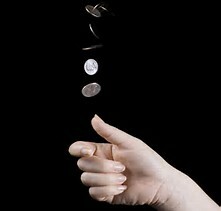 You flip an honest coin 100 times, and it comes up heads each time. What are the odds it will come up heads on the next flip? We’ve blamed el Nino, la Nina, butterflies in Africa, etc. I don’t think we’ve quite figured anything out. This entry was posted in Culture, Philosophy, Science and tagged climate, disaster, el nino, hurricane, la nina, storm, weather. Bookmark the permalink.